The fleshy parts of plants we eat tend to change colour. This can be due to ripening (e.g. 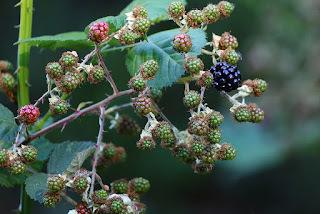 various berries turning red as they mature), intentional injury (e.g. apple slices turning brown after being cut), or changing external pH (e.g. red cabbage turning pink in vinegar). Let's look a bit at how and why this happens using a couple of examples. Strawberry fruit develops through green, white, and red stages. These correspond to changing levels of chlorophyll, anthocyanins, flavonoids, tannins, and other soluble phenols. The concentrations of chlorophyll and tannins start off really high in very young green fruit (chlorophyll = green colour, tannins = astringent taste) but then fall off as the fruit begins to grow rapidly and turn white. The brilliant red colour of a ripe strawberry is due to its accumulation of anthocyanins, driven by the high activity of an enzyme called phenylalanine ammonia lyase. 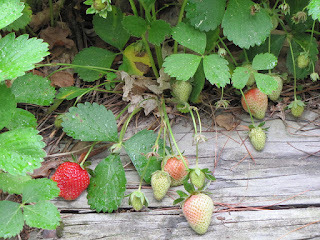 Strawberries will continue to ripen after being detached from a plant at the green stage. However, unlike other fruits such as tomatoes, apples, and bananas, this ripening does not require exposure to ethylene gas. Detached ripening results in a smaller strawberry with a relatively low sugar content, a less intense aroma, and off-putting flavors. The mincing, crushing, pureeing, or other mechanical disruption of garlic, onion, and leek (all members of the genus Allium) can lead to the formation of intensely coloured pigments within several hours. Processed garlic tends to turn green or blue, while onion and leek may acquire a pink or red discolouration. This is a big issue for companies selling these things since we tend to associate colour changes with spoilage. By mechanically breaking apart the contents of a garlic clove or onion/leek bulb, various substances are able to interact with one another to form intensely coloured pigments. Specifically, sulfur-containing molecules known as cysteine sulfoxides are broken apart by the enzyme alliinase into thiosulfinates, which then react with amino acids to form red, yellow, and/or blue pigments. Pigments can also be formed under acidic conditions (e.g. pH 2-3) independently of the action of alliinase. For example, green Chinese “Laba” garlic is prepared by soaking it in vinegar, and blue garlic can occur in pickles. Giant onion (Allium giganteum) bulbs acquire a vibrant red-orange colour if they are cut open or bruised. The pigment responsible for this colour change appears to be formed via a similar enzyme-driven pathway as the aforementioned pigments in garlic/onion/leek. A cysteine sulfoxide is broken apart by alliinase into a molecule that can react with itself to form a red-orange pigment. The enzyme polyphenol oxidase (PPO) is responsible for making crops such as apples, pears, and potatoes turn brown after they've been cut open. It transforms phenols (e.g. chlorogenic acid) into quinones, some of which polymerize (react with one another to form a chain) into brown pigments. Within plant cells, PPO is physically separated from the phenols it acts upon. When plant tissues are damaged (e.g. 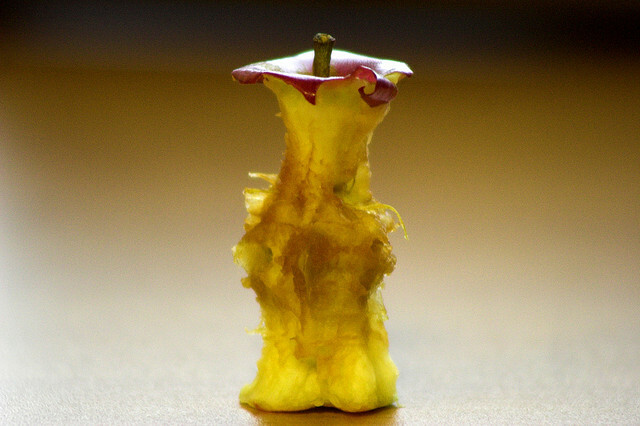 cutting up or bruising an apple), the enzyme is able to access and transform the phenols, resulting in browning. In apples, PPO is predominantly found near the core, which explains why a well-eaten apple is way browner than a lightly nibbled one. Researchers have targeted the enzyme in an effort to reduce browning in apples and potatoes. They used a bacterium called Agrobacterium tumefaciens to infect and subsequently introduce small chunks of DNA into plants. This DNA encodes special RNA molecules that are able to reduce the amount of PPO produced by plant cells, resulting in less browning. If you can't get your hands on a genetically engineered apple, browning can be reduced by sprinkling freshly cut apples with an acid such as lemon juice or vinegar. The structure of PPO is compromised at low pH, reducing its ability to initiate the production of brown pigments. Other more fancy ways to deactivate PPO involve zapping fruit with ultrasounds or UV light. Finally, several vegetables contain pigments that change colour depending on the concentration of protons around them (in other words, pH). Red cabbage is the classic example, containing anthocyanins that change to a wide spectrum of colours depending on the pH. Other vegetables that will change colour (albeit less drastically) according to pH include carrots, spinach, and beets. Bai B, Chen F, Wang Z, Liao X, Zhao G, Hu X. 2005. Mechanism of the greening color formation of "Laba" garlic, a traditional homemade Chinese food product. Journal of Agricultural and Food Chemistry 53(18):7103-7107. Chigurupati N, Saiki L, Gayser C Jr, Dash AK. 2002. Evaluation of red cabbage dye as a potential natural color for pharmaceutical use. International Journal of Pharmaceutics 241(2):293-299. Kubec R, Hrbácová M, Musah RA, Velísek J. 2004. Allium discoloration: Precursors involved in onion pinking and garlic greening. Journal of Agricultural and Food Chemistry 52(16):5089-5094. Kucerová P, Kubec R, Simek P, Václavík L, Schraml J. 2011. Allium discoloration: the precursor and formation of the red pigment in giant onion (Allium giganteum Regel) and some other subgenus Melanocrommyum species. Journal of Agricultural and Food Chemistry 59(5):1821-1828. Van de Poel B, Vandendriessche T, Hertog ML, Nicolai BM, Geeraerd A. 2014. Detached ripening of non-climacteric strawberry impairs aroma profile and fruit quality. Postharvest Biology and Technology 95:70-80.